Tobacco was introduced into the Islamic world by Europeans, who had themselves first encountered it in the Americas. The method adopted for smoking tobacco in the Near East was, however, different from that adopted in Europe, for the Persian kalian (in the Arab world a hookah and in India a narghile) is a type of pipe which uses a metal or ceramic vase containing water. The tobacco is burnt in a holder above the vase, and the smoke is drawn downwards through the water by sucking a hollow rod or tube attached to the shoulder of the vase. Rosewater is often used in the vase to sweeten the flavour. 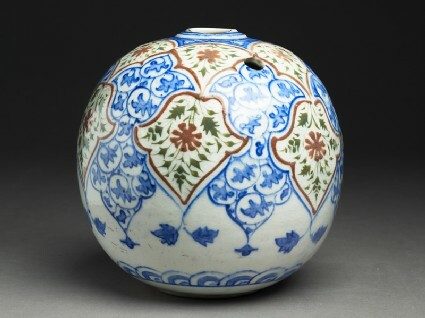 The two commonest forms in Persian soft-paste porcelain are the sphere and the pear-shaped bottle. The pear-shaped kalian illustrated [EA1978.1703] is decorated with rocks, pines and waterfalls in the Transitional Ming style of 1620 – 1683. 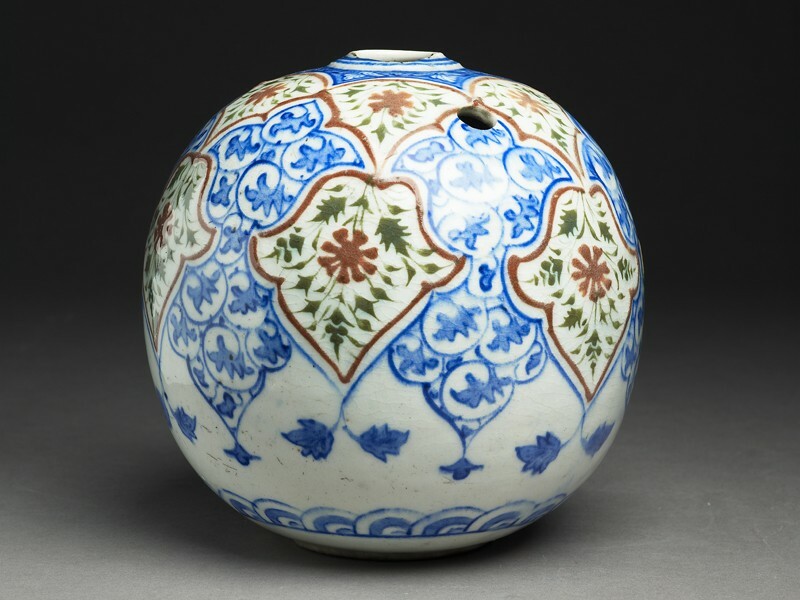 Very little Chinese porcelain was exported at this period and Persian copies are very rare. The spherical kalian [EA1978.1712] is an example of the polychrome soft-paste porcelains probably made in Kirman at this period. 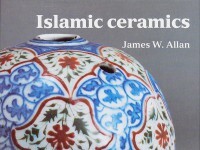 Late seventeenth century travellers, and the records of the Dutch and British East India Companies, all affirm Kirman as the producer of the finest ceramics of the day: its geographical location in central southern Iran meant that it was well placed for export to Bandar Abbas, a port at the eastern end of the coast of the Persian Gulf, and the Indian Ocean. The finely painted leaves and flowers in orange-red and olive-green suggest an origin in book illumination (cf. no. 34-35 [EAX.3080 & EAX.1207]), while the leaves and stems in underglaze blue are in a very decadent and totally contrasting style.